Richard Wagner (May 22, 1813 - February 13, 1883) was a German opera composer and key figure in the development of late Romantic music. He stretched the tonal systems of his day, using chromaticism for dramatic effect. Wagner also introduced the concept of the leitmotiv in his operatic plot development, a recurring musical theme associated with a particular person, place, or idea. Wagner was born in Leipzig during the chaotic final years of the Napoleonic wars. For over a century his paternity has been a subject of intense debate, a matter of little importance had Wagner not been rabidly anti-Semitic and had he not suspected that his father's friend, Ludwig Geyer, was in fact his natural father and that Geyer was at least partly Jewish. Following his father's death, Richard's mother married Ludwig, thus Wagner became and remained Richard Geyer until 1828. Legitimacy apart, Wagner grew up in a loving environment at Geyer's house in Dresden, together with his mother, brother and three sisters, and Geyer ensured that he received a good education. By the time Richard was in his mid-teens he was sufficiently interested in music to take secret lessons from a Leipzig teacher, and by 1830 was ready to enter the Leipzig Thomasschule where, among other subjects, he learned to play the violin tolerably well. He joined Leipzig University in 1831, extended his music lessons to take theory from Christian Weinlig and enjoyed the usual period of undergraduate dissipation. By then he had grown into a rather unprepossessing-looking young man, with a head too big for his short body (he was 5 ft 6 ins), a forceful jaw and high forehead. He began his career as a composer with a series of instrumental and orchestral pieces which betrayed their debt to Mozart, Haydn and Beethoven, his youthful Symphony in C receiving a Prague premiere in 1832. But with university over it was time for him to earn a living. His brother Albert, who had contacts in the theatrical world, secured him a position at the theatre in W�rzburg where Wagner gained valuable practical experience of many aspects of mounting opera productions. It also gave him direct knowledge of some of the most popular operas of the day, including Marschner's Der Vampyr and Meyerbeer's Robert le Diable. By then Wagner had already tried his hand at opera (Die Hochzeit and Die Feen), writing his own libretti, but his sister disapproved of the results and he suppressed the former work while the latter had to wait until after his death for its first performance. He had higher hopes for his next attempt, Das Liebesverbot (The Love Ban), a work based loosely on Shakespeare's Measure for Measure and described by the composer as a "grand comic opera". After being appointed as conductor in Magdeburg in 1834, he finally mounted a performance of it there in 1836, but the production company collapsed before a second performance could be mounted. The summer of 1834 found Wagner in Lauchstädt in the throes of his first major love affair with Minna Planer, a young actress with the Magdeburg opera company. His passion for her reached obsessive levels. For a time she kept him at arms' length, but after he had pursued her from Lauchstädt to Königsberg, she finally accepted his offer of marriage. Wagner was already establishing a pattern of behavior which he was to repeat many times over, and his flight to K∨molu;nigsberg was prompted as much by his debts in Lauchstädt as by his love for Minna. After his marriage he proceeded to run up new debts in Königsberg and within a short time Minna was sufficiently fearful of the future to escape to her family in Dresden. Wagner and Minna reconciled, but the marriage remained troubled. After an abortive season in Riga conducting light opera, Wagner fled the city under cover of darkness to avoid his creditors and made for Paris, where he hoped for a production of his new opera, Rienzi. Through an introduction fortuitously gained from two traveling companions he and Minna met on their way to France, Wagner called on Giacomo Meyerbeer on his arrival in Paris and the composer gave Wagner what advice he could for success in Paris. Operatic success eluded him, yet he managed considerable success as a critic while he was there, publishing a string of articles in several journals. In later years this was remembered as a humiliation, and his way of repaying Meyerbeer for his kindness was to publish anonymously a grossly anti-Semitic essay, Judaism in Music, which specifically attacked Meyerbeer's operas. Wagner also blamed Meyerbeer, groundlessly, for his travails in Paris. Wagner left Paris for Germany in 1842, Meyerbeer having helped him obtain a production of Rienzi in Dresden in 1841, and a production of Der fliegende Holländer in Berlin in 1843. Rienzi shows the influence of Meyerbeer in the way in which Wagner set and conceived his musical drama, and it is possible that, in his obsession with crediting only himself and Beethoven for all his creative developments (he similarly obscured the impact of Berlioz's music on his writing at this time), he deliberately attacked Meyerbeer and his music as the best form of defending his own unique genius to posterity. The post of Kapellmeister at the Dresden Court fell vacant soon after the successful premiere of Holländer, and Wagner was persuaded to take the position. He remained there six years, during which time he engaged in a sustained campaign to jolt the provincial Court out of its deeply conservative tastes. He continued to live well beyond his means and provoked criticism on a personal as well as a professional level. Nevertheless, during this time he completed Tannhäuser and it was premiered in Dresden in 1845 under his own baton. Indeed, many of his productions at Dresden were far-sighted and merit applause (his adherence to Gluck, for example). All this was brought to an end, however, by the 1849 revolution in Dresden. Wagner had backed the insurgents, writing inflammatory articles and helping to organize resistance to the Prussian troops. After the collapse of the insurrection, Wagner was lucky to evade arrest and made his way to Weimar where he threw himself on the mercy of Franz Liszt, a friend since his early days in Dresden. Liszt, then engrossed in preparing Tannhäuser for its Weimar debut, arranged for Wagner's safe passage to Switzerland. Anxious to commence earning an income outside Germany, Wagner moved to Paris, but failure to obtain a production of any of his operas, a fraught affair with a friend's wife and the triumph of Meyerbeer's Le Prophete drove him back to Switzerland in a bitter frame of mind. Liszt, however, went ahead with a first production of Lohengrin in Weimar in 1850, thereby declaring his loyalty to a composer he believed to hold the key to the future of music. Over the next two years Wagner completed the librettos for the entire Ring cycle. His Swiss exile was a great hardship for him, but he certainly employed the time profitably, writing Das Rheingold (1854), Die Walküre (1856) and two acts of Siegfried (1857). 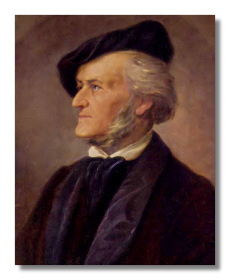 During these years his reputation continued to grow through the performance of excerpts from his operas, (he called them, graphically, "bleeding chunks") such as those heard by Queen Victoria and Prince Albert (including the Tannhäuser Overture) in London in 1855 under Wagner's own direction. His intense and sustained burst of work on The Ring was interrupted by his sudden switch to the story of Tristan und Isolde, which engaged his full attention after he and Minna moved to a cottage near Zurich provided by his friend and patron, the rich businessman Otto Wesendonck, who lived nearby. The reason for this sudden change was the onset of a passionate affair between the composer and Wesendonck's wife, Mathilde. Wagner long suppressed his feelings towards this woman, but now the close proximity led him to press his Suit, and Mathilde responded. The fast-appearing tragedy of Tristan was clearly being composed as a corollary to their doomed passion. Minna discovered Wagner's liaison with Mathilde, and although Wagner was to finish Tristan – his opera dedicated to his doomed affair with Mathilde – as well as the beautiful Wesendonck Lieder (settings of poems by Mathilde), the affair was ended by Wesendonck removing his wife to Italy. Wagner completed Tristan before the close of 1859, producing an opera which was to prove as influential as any other written during the 19th century. There are few areas of Classical music the harmonies of Tristan did not reach in the next 50 years, and the deep neurosis of the work, embracing love and death as two sides of the same coin, admirably suited the fin de siecle sensibilities of the time. For the next few years Wagner led a calmer but peripatetic life, even advancing plans for a grand comic opera which was to become Die Meistersinger von Nürnberg. By early 1862 he and Minna had agreed to a final separation and she moved back to Dresden. An 1863 concert tour in Russia brought him a financial windfall which enabled him to live extravagantly in Austria until he ran up debts which threatened his imprisonment. In 1864 he was still rootless and looking for somewhere to settle when he was summoned to Munich by Ludwig II, the new 18-year-old King of Bavaria. His relationship with Ludwig II was remarkable in many ways, not least because the two men rarely met, preferring to communicate by letter even though Wagner was in the same city. The composer was given very generous terms over the years of Ludwig's patronage, being paid large sums of money, some of which he latterly used to save his Bayreuth project from collapse. But Wagner's conspicuous consumption of Ludwig's money, allied to a transparent contempt for the local aristocrats, precipitated a move from Munich to Lake Lucerne in 1865. By this time he had begun an affair with Hans von Bulow's wife, Cosima (nee Liszt), and his first child by her, Isolde, was born in 1865. Afraid that Ludwig would throw him out, Wagner and Cosima refused to admit to the child's illegitimacy, though Wagner's domestic situation eased somewhat with the death of his wife Minna in 1866. In the following years Wagner balanced his demands for total artistic and financial freedom with Ludwig's demands to see results for his generous patronage. Against the composer's wishes, the first two operas of The Ring (Das Rheingold and Die Walküre) were premiered in Munich between 1869 and 1871, and Ludwig pressed Wagner continuously for Siegfried to be completed and staged there as well. But Wagner had found in the village of Bayreuth the ideal setting for the realization of his ideals of German opera for the future, and was determined to press ahead with his plans to build an opera house to his specifications. Cosima moved there in 1868 and after her divorce from von Bulow in 1869, she and Wagner were married. By 1874 Götterdämmerung had been completed. So, too, had Wagner's own house in Bayreuth, Wahnfried, into which he moved Cosima and the children. But the theatre project came close to collapse as funds ran out and new investors proved hard to find. At this point Ludwig saved the project with financial aid: his reward was the manuscripts of many of Wagner's operas. He also came to the 1876 dress rehearsals for The Ring (the first season): it was his first meeting with Wagner in eight years. Two years later, when the entire festival organization was close to bankruptcy, Ludwig again interceded and all debts were liquidated. True to form, Wagner put the blame for the poor attendance during the first years of Bayreuth onto those groups he had spent most of his life berating, writing articles and essays excoriating the so-called elements in German life – Jews, radicals and so on – that prevented true Germans from appreciating his music. Certainly his last opera, Parsifal, is a spiritual expression of many of these debatable viewpoints, and although it is perhaps his greatest and most completely realized musical creation, there has never been general agreement on the exact nature of the Christian message at the heart of the opera. There have also been suggestions that this great spiritual work was initially inspired by his passionate and illicit love for another woman, this time Judith Gautier (daughter of the French writer Theophile Gautier), whom he had met in 1869. It was premiered at Bayreuth in 1882, by which time Bayreuth had become an annual place of pilgrimage for many of the most radical spirits in European culture. In early 1883 Wagner went with Cosima to Venice to rest and plan for the future, but succumbed to a heart attack on 13th February. His body was transported back to Wahnfried and buried in the grounds nearby. Cosima lived until 1930, effectively shaping the posthumous reputation of her husband through her own highly selective interpretation of his legacy and life. Undeniably, his greatest achievement is the cycle of four massive operas, completed in 1876, and known as Der Ring des Nibelungen (The Ring of the Nibelung) or simply "The Ring", consisting of Das Rheingold (The Rhine Gold), Siegfried, Die Walküre (The Valkyrie), and Götterdämmerung (Twilight of the Gods) composed in order between 1869 and 1874.